My eye weeps over the destruction of the holy community of Chust, a major center of Jewry that had been filled with Torah scholars–devout, God-fearing, and pious men of good deeds–who had maintained an uninterrupted presence there for more than a hundred years. From my holy forebears and the [other] leaders of the rabbinate of Chust, Torah rulings spread out to all of Israel. The voice of Torah was heard on the streets of Chust day and night. It was a fortified tower guarding the ways of traditional Israel. And during the ten years that I served as rabbi of this holy community, I toiled and persevered to continue in the ways of my forebears and maintain those good, established ways. Until the day that our city was destroyed, I taught Torah to the many students of the yeshiva, thank God. But woe, woe that this tower of Torah should have been devastated in my day, and that before my eyes the murderers’ hands prevailed over it. May Hashem take vengeance on behalf of His people–before our eyes! I have undertaken to inform the coming generations what befell us in those days, wearisome days, so that they, the children yet to be born, will learn of the evil perpetrated against us by the nations, and the terrible tragedy that we endured (for our many sins): how the great and noble Jewish communities of Poland, Hungary and other European countries, holy communities and bastions of Torah that had been built and established over the course of the years of our lengthy exile with infinite toil and labor and with the holy determination of thousands of families, those who fear God and tremble at His word, were destroyed and laid waste. Give honor to Hashem, before the days of evil arrive (cf. Yirmiyahu 13:16). Although I saw only what occurred in our city, the holy community of Chust (Carpatho, Russia), and what took place around me in the death camps, it is known that everything was carried out in a coordinated fashion, following one cruel, premeditated plan. In this way, six million holy and pure souls, the best of the nation, its finest–young and old, babies and women–were killed, burnt and liquidated, and their possessions stolen. In every city and every country trampled by the feet of the evil, cruel Nazis, may their name be blotted out, the destruction and the holocaust took place. Toward the end of 5699 , World War II broke out. With great might and a strong hand, German troops attacked a peaceable Poland. As soon as they arrived, they began to destroy the countryside and to deliberately kill the most pious Jews and destroy entire Jewish communities. At that time, I was in the area called Carpatho-Russia, a part of Czechoslovakia, which began to crumble beneath the heavy steps of the Nazi conqueror. Our region passed from one nation to another and from one sovereignty to another. [First] the Nazis gave Chust and its surrounding regions to the Ukrainians, and as a result the country of Smaller Ukraine was recreated. During the days of its brief rule, we suffered many fears and terrors, for the Ukrainians are known with good reason to be extremely anti-Semitic from earliest times. Day by day, they instituted anti-Jewish laws and decrees that affected both our religious freedom and ability to support ourselves. But this did not last long. After a short while, the Hungarian army prosecuted a war against them, and the battle spread to Chust, which the Ukrainians had made their capital. We fearfully sat in our hiding-places, while the battle raged for three days, until the Hungarian army was victorious and killed a great many Ukrainians. We thanked God for the miracles that He had performed for us, for we learned that the Ukrainians had intended to vent their wrath on the Jews, and to that purpose had already prepared a Black List of whom to kill. But their plans were overturned. As for the Hungarians, their society had long been permeated by a great and profound hatred toward the Jewish people. The “Jewish laws” that had been promulgated to persecute Jews at every step are well-known. Now that we were absorbed into Hungary, these anti-Semitic laws were immediately enforced. In Chust, Jewish-owned stores–which were the majority of the stores–were shut down in the course of one day, and it became illegal for them to sell any merchandise. It is hard to express the anguish and bitterness that those Jews who drew their meager sustenance from those stores felt. The source of their income was sealed shut, and they were left to starve. But there was even greater suffering. Jews were taken to military work camps that had been set up especially for Jews. Hundreds and thousands were sent to the battlefields against Russia. There they were at the mercy of degenerate Hungarian officers who would place the Jews at the front lines and would always give them the most dangerous assignments. An especially tragic chapter is the series of terrible sufferings that thousands of young Jews in those battlefield work camps bore, many of whom died sanctifying God’s name and whose memories are lost, may God avenge their blood. Within the very first year of the war, the countryside was filled with orphans and agunos (grass widows), heaven have mercy. In every city, the gentiles fell upon the Jews and attacked them. One time, soldiers attacked Jews on the holy Sabbath during the Third Meal and wounded a great many of us. That Saturday night they entered the great synagogue, destroyed everything inside, and desecrated the Holy Ark and the holy books. Not a day passed without some decree and distress. And the years passed in this way for so long that we almost became inured to the violence and evil. These things I will recall and pour forth my soul. In the year 5700 [1939-40], about three thousand Jews, most of them from our area, were cruelly deported to Poland, which was ruled by the German beasts who hunted down the blood of Israel. These Jews were seized with the excuse that they lacked Hungarian citizenship. But this was not even true. The Hungarian guards performed their work viciously. It was terrible to see group after group of Jews being led from village to village, day and night, pitiful and wretched, men, women and children, as the guards beat them with their rifles. I will mention one incident that I myself witnessed, from which the extent of their cruelty can be gauged. During this expulsion, a woman with five small children whose father had been sent by the Hungarians to the battle field were brought to our city from a nearby village. When the children arrived, they succumbed to a very high fever, and the doctors said that they had contracted scarlet fever, which is of course contagious. In our naivete, we imagined that the Hungarians would at least allow them to recover before expelling them. But this was not the case. They merely added a separate car to the train, placed the mother and her children in it, and deported them. These deported Jews were sent across the Polish border, where they were literally thrown out of the train onto the ground. The local Ukrainians treated the Jews with the profound hatred for which they are so renowned, and so the Jews wandered about from place to place, weak and broken, until they arrived at the city of Kamenitz-Podolsk. There they suffered from starvation, and many of them died. At summer’s end, the Jews were ordered in the name of the German army and Polish militia to gather at a certain time in a certain place with their possessions, from which they would be sent home. The Jews naively obeyed these instructions, and gathered together in one area with their bags in their hands. When they were all assembled, they were cruelly gunned down, bullets firing at them from every direction. At that massacre alone, almost twenty thousand people were buried in one grave. A tiny remnant was miraculously saved. They came back and told us everything that had happened, and we tore our garments in grief. Those few survivors reported that for three days, the dirt heaped over the mass grave continued to stir, for thousands of the victims had been buried alive, and they were moving and convulsing in their wounded agony. May God avenge their blood amidst the blood of the other righteous and holy martyrs. On the first day of Selichos, I delivered a bitter eulogy in the synagogue of Chust. We suffered like this for several years–without tranquility, quiet or rest. And then the wrath arrived in the month of Adar 5720 [winter, 1940]. All the countries surrounding Hungary were controlled by the barbaric Nazis, may their name be wiped out. Now the German armies invaded Hungary and laid siege to Budapest and other areas. This was a bitter, terrible day for Hungarian Jews–one that will never be forgotten. On this day, their fate was sealed, with no refuge for anyone. As soon as their feet tread upon the land of Hungary, the Nazis destroyed synagogues and study halls, and laid waste to the land. They supervised the establishment of a new government whose members were well-known anti-Semites. This government was in perfect accord with the Nazis, and even tried to exceed their evil. Decrees multiplied day by day. One rule that they put into effect immediately was that every Jew must wear a yellow Star of David. Whoever did not do so would be treated as a criminal. Even small children who did not wear the star were mercilessly beaten. Such a decree is already cited in old texts. For instance, in his travel letters, Rav Ovadia of Bertinoro tells of having seen the Jews of Salonika wearing red stars and living in a ghetto. In addition, the halachic authorities have already discussed whether wearing such a patch is considered to be carrying, which is forbidden on the Sabbath. The entire land shook from the roar of the mighty German army. We were in the distant south and for a few weeks we were still filled with the hope that the cruel enemy would not reach us, because the Russian army stood not far from the Hungarian border, which was a mere seventy miles from Chust. But our hopes were dashed when the Germans succeeded in holding off the Russian army. In the week of Passover, Gestapo agents arrived in our city. As soon as they arrived, they entered the mansion of a wealthy Jew and ordered him to leave immediately, without taking so much as a shirt. They also ordered him to tell the rabbi and a few community leaders that in exactly two hours they must appear before the Gestapo. 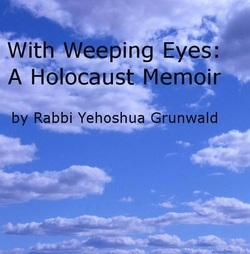 This Jew came to me weeping and anguished, and reported all this to me. All of us who had been summoned met, and the entire city was filled with terror. Many members of the community gathered in the synagogue and prayed that we would emerge in peace and return home. Our own hearts were filled with trembling, because we had already heard how in Poland the community representatives who had been summoned before the Nazis had not returned. He concluded by saying that in order to ensure that all of these matters would be adhered to, we must come up with a guarantee of a quarter million fenga, to be delivered into his hands within the next twenty-four hours. We left, our hearts filled with worry, anguish and distress. We knew that the establishment of the Judenrat meant the dissolution of this holy community. And as we worried how the Judenrat could gather together such a huge sum of money in the short amount of time allotted to us, we were seized by trembling. The Judenrat announced this demand to the city residents. Men brought money and women took off their golden earrings and wedding rings, and gave deposits, and the amount was raised. Within twenty-four hours the sum demanded of us in exchange for our lives was delivered. “When the Beis Hamikdash stood, a person would donate his shekel and gain atonement. Now that there is no Beis Hamikdash, if a person gives charity, that is good. If not, gentiles come and forcibly take his money–and that too is considered charity. As the verse states, ‘[What you give to] your creditors will be charity’ (Yishaya 60:17)” (Bava Basra 9). From that time onward, the Germans did not cease afflicting us with requisitions by telephone. They constantly made demands of the Judenrat. Not one hour passed without their extorting something new from us. Once they demanded coffee, which had been withdrawn from the market during the war and which could not be obtained. Another time they asked for alcoholic drinks that were almost impossible to find. Once they wanted jewelry. There were many other such requests, and each request was accompanied by the threat of death. One day they announced that the following morning they would need five hundred men for various types of work, and that if they did not get that amount of men, they would kill two men. Messengers stayed up the entire night, knocking on doors and telling the men to go out to work, and that not one person should fail to appear, heaven forbid. [From then on,] every day hundreds of men went to forced labor, working on the Sabbath, holidays and weekdays, and without any food. During all their hours at work, their families would sit in fear, anxious about their fate, because we knew of incidents in Poland where people had been taken to work and had never returned. In previous years we had been busily engaged during this season preparing for the holy holiday of Passover. But now we were immersed in mourning and sadness. We had matzos, because they had been baked before these evil Germans had come to our city. But when Hasidim and pious men attempted to bake matzah especially for the mitzvah on the eve of Passover, they were interrupted by these criminals, who arrived in the middle of the work and prevented it from being completed, and people had to escape through the windows. On that day–the eve of Passover–the Gestapo drove me from my home and my beis medrash. They did us the “kindness” of allowing us to use one room [of my home]. On the night of Passover, we celebrated the seder in whispers, fearful and terrified, because they were in the adjoining room. On the second night of the holiday at midnight, the air raid siren sounded. We descended into a cellar, where a great many people were gathered, and there we recited sefiras ha’omer and completed the seder–in the depth of the pit. On the first day of Passover, I had to follow the Germans’ orders and deliver a sermon. As soon as I stepped up to the bimah, everyone broke into tears of grief. I said to myself, “What can I say? Life and death are in the power of the tongue.” And I spoke briefly on the Torah to strengthen people’s trust in God. The words “now we are here” are superfluous, for we obviously know that we are here. However, our sages said, “The Holy One, blessed be He, does not perform a miracle for nothing.” [Similarly, these words were not placed here for nothing]. Until now, throughout the war and the general chaos, the Holy One, blessed be He, has performed miracles and acts of kindness for us. Is there a greater miracle than that “now we are here,” that we are still here in our place even though millions of our fellow-Jews had to leave their homes years ago? From this, we can conclude that the Holy One, blessed be He, will not withhold His kindness from us, and He will perform yet another miracle for us, so that in the coming year we will be in the land of Israel and attain the true redemption. I spoke only briefly so as not to stumble in my words. On chol hamoed, we heard the terrifying news that the [Nazis] were going door to door with a list in their hand to arrest Jews and lock them into one of the batei medrash. Whoever was able to hid in the cellars and attics. I myself hid in an attic, stretched out on the floor. In the evening, we heard that the Germans had ceased searching the houses, because the beis hamedrash was already filled. There they tormented the people with hard and cruel tortures until they cried out in their agony. One day on chol hamoed, I received a summons to appear before the Hungarian border patrol, who were known to be particularly cruel. When I arrived, an officer stated that they had caught a Jew who had fled from Poland, and that I had helped him come here. I was unable to respond because I was terrified by his face, which burned with blood lust. But the officer in charge dismissed the man’s words, saying that at any rate the fate of the Jews was sealed. As soon as Passover was over, the Judenrat was summoned before the Gestapo and was commanded to set up a ghetto to separate the Jews from the gentiles, on the pretext that Jews were engaged in propaganda that hampered the war effort and were poisoning the spirit of the people. The Jews would thus be given selected houses where they were to remain separated from everyone else. A directive was issued that a few hundred men should set up the ghetto and surround it with iron barriers, and that the work must be completed within the next three days. When this announcement became known, everyone was in shock and panic, for the final blow had come. We knew a few details of what had happened to Jews in various ghettos that had been set up under Germans rule. Now gendarmes went from house to house with orders that the inhabitants leave, taking with them a few items only, such as pillows and eating utensils. Everything was done in a great rush. The gendarmes stood over people, hurrying them and striking them with lethal blows. In this way, the Jews were stripped of their possessions. Their wealth, which they had earned by their toil generation after generation, decade after decade, was left to others. Each house was sealed and each man and his family were taken to the municipal building like murderers and thieves. There, their clothes and sheets were again searched. Anything made of silver or gold, or that had any value, was taken away. Similarly, their money was taken, until they were bereft of everything. Now, with the few possessions that they were allowed to retain, they were taken to one of the ghettos that had been set up in our city. This ghetto (as mentioned) was surrounded by a wall, and it was guarded day and night by these evil men, in order to prevent anyone from entering or leaving. Living accommodations were very crowded. As a general rule, one average-sized room housed twenty people or even more. Food was very scarce, and was mostly obtained by thievery outside the walls, carried out by the hundreds of men and women, who went every day to slave labor. This was the state of the ghetto within the city. In the ghettos outside the city, a terrible famine prevailed. The Nazis, may their names be erased, entered the ghetto every day and issued new and bizarre orders in order to cause suffering and terror. And every new decree was accompanied by blows and panic. In particular, they cruelly and viciously tormented people in order to learn where they had hidden their silver and gold. While we were in the ghetto, the sealed houses of the Jews were opened and the spoils divided. A great deal was sent to Germany, with the remainder staying in Hungary. The city’s gentile residents grew rich from the spoils and wore the expensive clothing that they had stolen from us. The words of the biblical rebuke were fulfilled in their entirety: “A nation that you have not known shall eat the fruit of your earth and all of your toil, and you shall be oppressed and crushed all the days.” It was especially painful to see even those gentiles whom we had previously known and who had always been at peace with the Jews taking part in the pillage. “They consumed my people [like a person] consuming bread” (Tehillim 14:4).